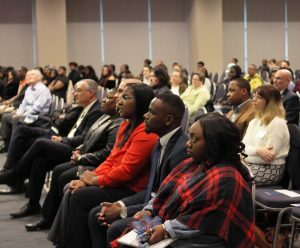 Marcia Cole addressed a crowded audience on Thursday night during the university’s opening ceremony for Black History Month, and stressed the continued importance of demanding justice and condemning discrimination in order to end modern racism. Cole detailed the prolonged pain and determination that civil rights leaders faced and how those ideas relate to the current struggle for equality. She encouraged those in attendance to work for what they believe is right, even in the face of political and social pressures to do otherwise. Cole said that far too often good people fall into a state of complacency in the wake of injustice, and she noted that there is an important difference between recognizing injustice and taking action to repair the damage. 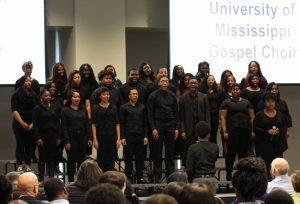 Provost Noel Wilkin said he has high hopes that the university will embody Cole’s message throughout the anticipated Black History Month celebrations and remember that Ole Miss should be an inclusive campus for all of its students. “It is my belief that this month’s celebrations can inspire a vision of hope that we can work together side by side to pursue a better society and a welcoming community for everyone,” Wilkin said. The event also included an awards ceremony, honoring faculty who contributed to the improvement of human relationships on campus with the 2019 Lift Every Voice Awards. One of these awards was presented to James Thomas, John Green, Kirk Johnson and Willa Johnson of the sociology department for their work on the UM Race Diary Project. The UM Race Diary Project consisted of research compiling the anonymous responses of more than 1,300 students detailing examples of microagressions in the Ole Miss community, from racist, homophobic or sexist comments made on campus to acts of physical aggression on the Square. 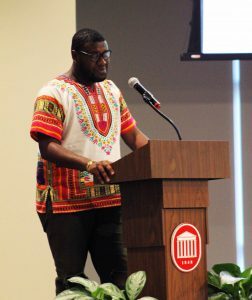 Jarvis Benson, the president of the Black Student Union, spoke about his struggle with the gaps in his genealogical history as a result of slavery, but said he does not feel lost without total knowledge of his ancestors.